Siem Reap is a city that started slowly, but has flourished in recent years as the gateway to the Temples of Angkor. And while many travel to South East Asia and rely on tour guides on the ground to provide historical context, there is something to be said about traveling with a knowledge of your destination before you arrive. You understand your destination on a much more intimate level than other tourists who plan on only half listening to their guide. You have a greater appreciation of the culture, people and place, and can let your hands explore the stone relics of ancient civilizations knowing exactly what it took to carve and chisel these wonders of the world. 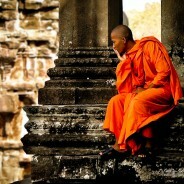 The following is a brief history of Siem Reap (the gateway to Ankor) to provide historical context before your trip.